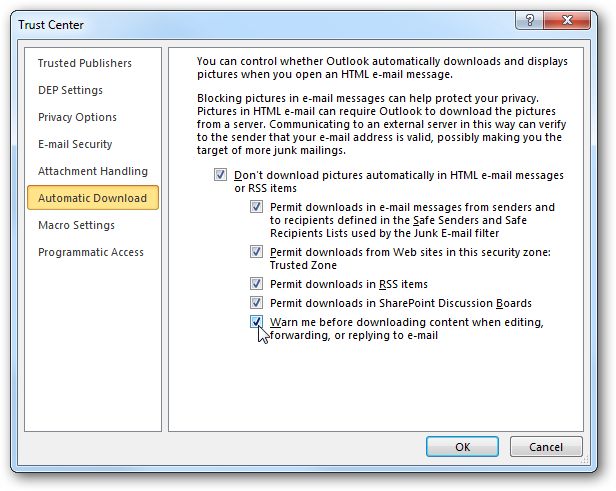 By default Outlook will block images in HTML formatted email until you allow them to be downloaded. This is due to possible malicious code that may be included. Here is how to always accept images from trusted senders. 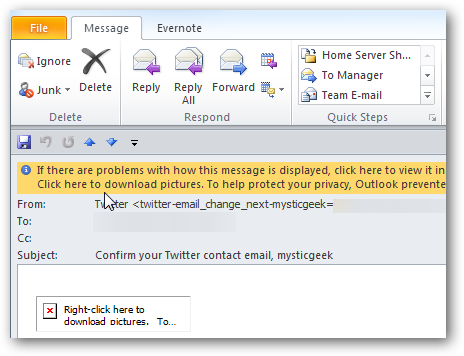 When you get an HTML email for the first time that contains pictures or images, you’ll see a yellow security message at the top of the message. To download the images once, right-click on the message and select Download Pictures. 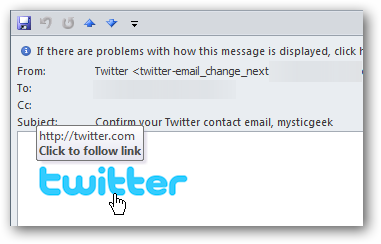 After that the pictures for the email will be displayed, where in this case it’s the Twitter logo. If you always want the images from a specific sender to display images, select Add the Domain @whatever.com to Safe Senders List. This way all future messages from that sender will be displayed automatically. If you click on Change Automatic Download Settings, the Trust Center will open and you can fine tune the rules from there. Of course you want to use your best judgment when always allowing images. But if you’re getting newsletters say from Microsoft or us here at How-To Geek, you can be assured there is no malicious code contained in them. This way you don’t have to take the extra step of downloading the pictures every time. Of course maybe you don’t want the images to download so the email opens faster and you can click on the link to go straight to the sender’s website.